There was nothing on the line but pride when Crook County and Ridgeview took the field Tuesday afternoon for an Intermountain Conference girls soccer match. After all, the two teams are headed in opposite directions. The Ravens had won eight consecutive matches, while the Cowgirls have struggled, losing nine of their last 10 matches. The Crook County season once looked promising, as they won two consecutive matches heading into the league season. However, injuries have decimated the team as multiple players have gone down with season-ending injuries. With two teams heading in opposite directions, the outcome of the game was probably a foregone conclusion. The Cowgirls held Ridgeview scoreless for the first 15 minutes of the road contest. However, the injury bug hit again, and the team was unable to recover as the Ravens rolled to an 8-0 victory. 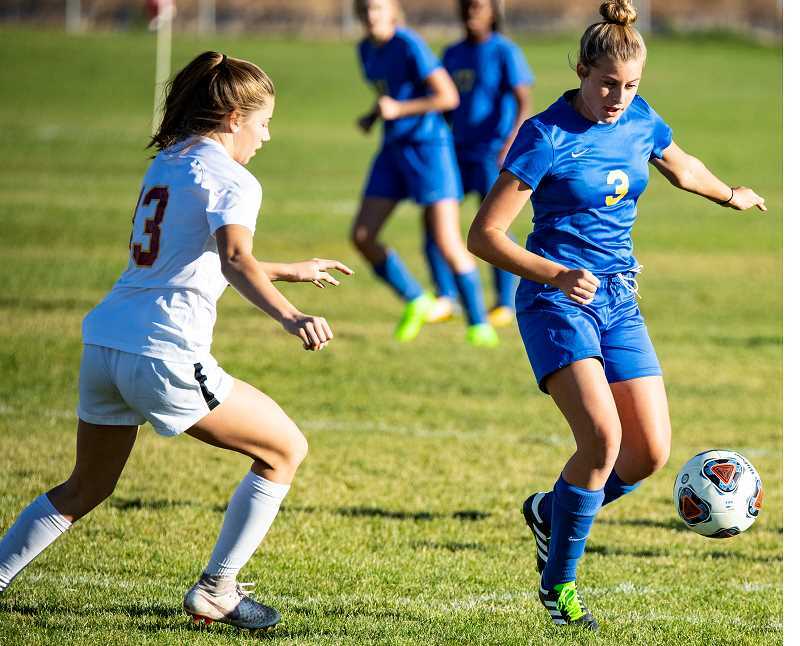 "Once Tansy (defender Tansy Clark) got injured, the goals just started flooding in," Crook County head coach Rich Abrams said. "We just weren't able to adjust. A reporter asked me after the game what there was that we could take away from the match, and I said, 'more injuries.'" Still, Abrams was pleased with his team's effort in the loss. "The last time that we played them, I don't think that we got a single shot on goal," he said. "This time, we had scoring opportunities, and we were almost controlling the game for a short amount of time in the second half." Sixteen minutes into the match, Averi Hartford started the scoring for the Ravens. Grace Sorensen scored in the 18th minute and then again in the 28th minute, while Sadie Benz scored in the games 25th minute as Ridgeview took a 4-0 halftime lead. Following halftime, Crook County had a brief burst of energy and led by the play of forward Faith Wagner had several scoring opportunities. "Faith had a really good game," Abrams said. "She literally unnerved their defense. She would win the passes constantly and then she would control them perfectly. Her ball control was phenomenal." Abrams added that in addition to feeding other players the ball, Wagner also had two good scoring opportunities of her own. "She got two breakaways and one the goalie just barely saved," Abrams said. "Faith just rammed it, and the goalie just got a fingernail on it and put it over the goal." On the second breakaway, Wagner missed just wide of the post. Still, Abrams noted that it was the first time that the Cowgirls were able to put that kind of pressure on a good team since forward Gracie Kasberger went down to a knee injury early in the year. "Wagner was creating a lot of offense, and we haven't had that for a long time," he said. "Not since Gracie got hurt." Still, despite the scoring opportunities for much of the match, the Cowgirls had difficulty getting the ball across midfield. Sorensen scored her third goal of the match early in the second half, while Benz, Abby Martin and Kellyn Anderson each added second-half goals for the Ravens. With the win, Ridgeview wrapped up the Intermountain Conference championship and guaranteed themselves a home playoff match. The Ravens are 10-2-1 overall and 9-0 in conference play with one match left to play. Meanwhile, the Cowgirls, 2-11-1 overall and 0-8-1 in league, closed out their season at home on Thursday with a match against the Redmond Panthers, 2-9-2, 1-6-2. In their previous meeting, the two teams tied 3-3.